This is so simple and really a perfect accompaniment to your own at home BBQ’s too – means you get to sit out on the deck/verandah/patio instead of being in the kitchen. I have to admit that I may have just made this one night and forgot about having anything else! It was just nice in a bowl. Albeit the next day I added some shredded chicken. Place cheese into TM bowl and grate 6 sec / speed 6. Set aside. Place garlic, spring onions, oil and bacon into TM bowl and chop 3 sec / speed 5. Scrape down and sauté 5 mins / Varoma / speed 1 / MC off. Add sour cream, milk and soup mix. Place potatoes in both layers of Varoma and cook 15 mins / 100°C / speed 1/ Reverse. Pour the cream sauce into a small bowl and set aside. Pour boiling water into TM bowl and insert simmering basket and place in eggs. Place Varoma with potatoes back into position and cook 15 mins / Varoma / speed 2. Remove simmering basket with spatula. Place eggs into a sink or bowl of cold water to cool down as you peel them. Slice eggs. 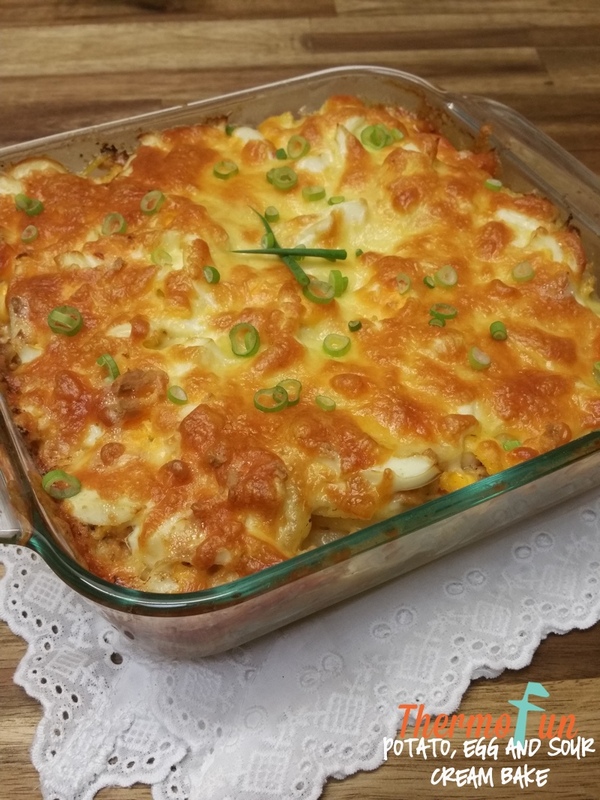 Place a layer of potato into a large rectangle casserole dish, add half sauce and sprinkle with half cheese. Repeat again with another layer of potato, sauce, egg and cheese and bake 20 mins. this was amazing! my son complained i didnt make enough as he polished off what was left in the dish ??? Can you just beat the egg mixture and pour in instead and bake that way? Hi Barbara, I’ve never done it that way but it could be worth a try. I personally like the chunks of hard boiled egg throughout. I’d love to hear how it goes if you do try it. This is one of our family favourites, so easy to add some shredded chicken, or to have by itself. I love the hard boiled eggs in this recipe, and the layering too, such a yummy dish hubby said it was really good! Will have to cook it again soon! I found the cream curdled and will wait and see the outcome when taste tested. On checking other similar recipes on your website I notice the cooking time for the cream mixture is no where near the time with this recipe. Any opinions on this? How did it turn out Ruth?